In order to make the most of Alberta's deregulated electricity market and make an informed decision about your electricity, it is important to understand the different components of your utility bill. Energy supply is not the only part of your bill; transmission, distribution, and administration charges also make up the cost of your electricity. 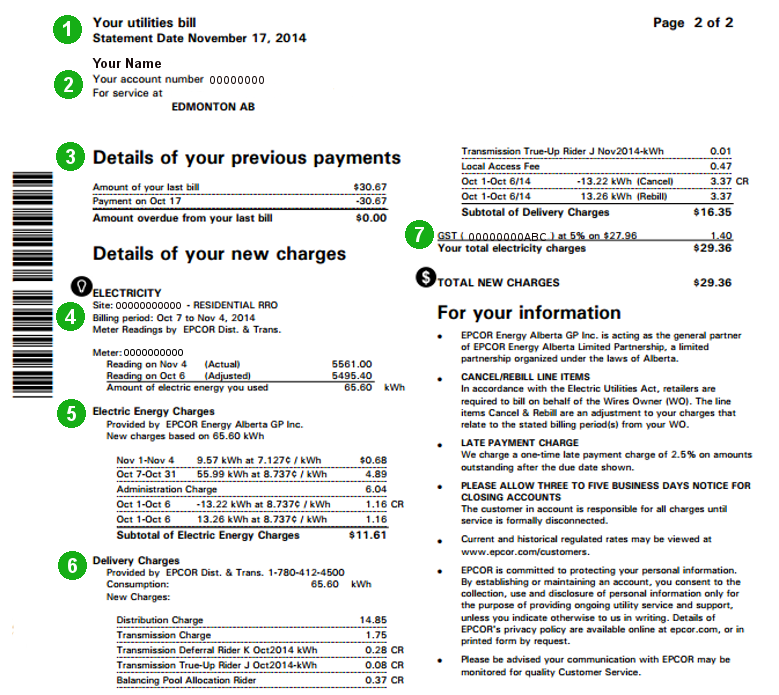 Most of these costs are regulated by the Alberta Utilities Commission (AUC). Account number: this is the number of your account. You will need to have this on hand when you contact your utility or energy supplier. It is important that the entire number as appears on your bill is to used pay it. Meter reading: your meter should be read once about once a month, though sometimes reading will be estimated. Your utility will indicate whether the meter readings are actual, estimated, or adjusted. Local Access Fee: this is charged by your local municipality for the electric utility to use the municipal land for the electric distribution system and/or for the right to be the exclusive distributor for the area. It is not approved by the AUC. Your bill should also include the due date for paying your bill. Late payments are usually subject to a monthly 1.5% interest by utilities. How will my bill change if I choose an energy marketer for my supply? Most of the time you will continue to receive your bill from your local utility, who will remain responsible for the delivery of your electricity. Most of your bill will remain unchanged; the main change that you will see to your bill will appear under your electricity charges, where you will find the name and phone number of your energy supplier, and the rate that you pay for your electricity.